Rejuvenate and Recharge: A Springtime Juice Cleanse | Grand Central Magazine | Your Campus. Your Story. This week might be filled with green beverages for St. Paddy’s Day, but we’re filling your cup with other greens – vegetables. When blended into a juice cleanse, veggies (along with other healthy ingredients), are a way to get your body back on track after a week filled with junk food and sugary drinks. Grab your juicer or blender for the ultimate detox to cleanse your body from toxins and rejuvenate you for a fresh start to spring. Before you cut out solids and cut right to the liquids, prepare your body for the juices’ detoxifying effects. Three days prior to your cleanse, drink 64 ounces of water throughout the day. Keep meals light, eliminate junk food and eat lots of fresh fruit and veggies. 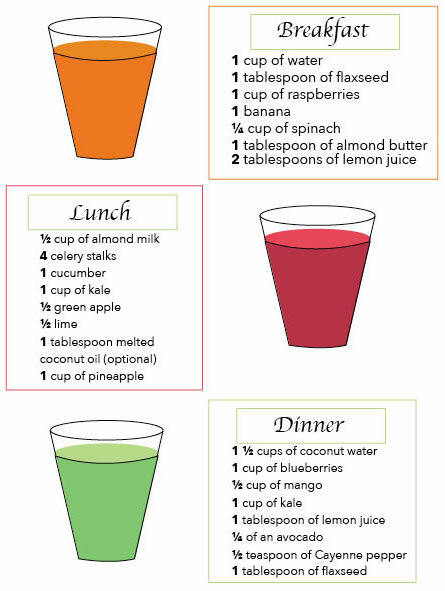 For breakfast, lunch and dinner, replace solid foods with these delicious juices. While consuming juices, engage in light exercise, keep a positive attitude and note your body’s responses to its replenishment. After consuming juice for three days, make sure to drink plenty of water. Begin to re-incorporate solid foods back into your diet, and reinstate normal physical activity. Don’t forget to thank yourself for taking the time to detox and replenish your body – one juice cleanse at a time. Separator image Posted in Food & Wellness and tagged with Anne Langan, Colleen Dluzynski, Juice Cleanse, Sports & Fitness.